For patients looking for a facial rejuvenation without any downtime or enhancement of certain facial features, facial fillers are an excellent option. As a facial plastic surgeon, Dr. Bublik utilizes his understanding of anatomy and aesthetic vision to achieve near-surgical results. Dr. Bublik is known as an injectable specialist, and is sought by patients who desire a higher level of care in their injectable treatments. Fillers, which come in a variety of materials, including animal and human collagen, human fat, naturally occurring substances in the body, and so forth, are injected into the depression or crease in a wrinkled area. We classify them as temporary, semi-permanent, and permanent. In general, we use fillers to replace volume, which then helps to restore a natural, rested look. Unfortunately, we associate a sunken, gaunt look with age and disease, whereas we are all attracted to the youthful fullness of a face that has retained its curves and a supple appearance. Some fillers fit the definition of a non-extreme treatment we offer to help individuals to look good quickly and make a good first impression. Some filler treatments can be done in minutes in the office with very little downtime. Most of the newer filler agents available today can provide a great youthful look by the coming weekend. We sometimes use fillers in combination with other treatments. A Botox injection, followed by a filler and laser treatment, is one of the most common combination treatments and is a fast way to make an improved first impression. Both men and women seek injectables to restore their youthful appearance without drastically altering their looks, in order to enhance their attractiveness and self-confidence in their social and personal lives, and in today’s competitive workplace and business environment. Over the past five years, the use of fillers has become more and more popular, but the concept itself isn’t new. In fact, as early as 1893, doctors discussed the idea of using fat as a filler agent within facial wrinkles and creases. In the 1920s, a few doctors injected fillers such as paraffin, silicon, and mineral oil to remove wrinkles and rejuvenate facial appearance. In facial rejuvenation philosophy, interest in fillers has increased as thinking evolves from using surgical tightening procedures towards the direction of what we call volume replacement. Many cosmetic surgeons now recognize the benefits of restoring volume to the face in order to recreate a youthful look. With age, the skin loses elasticity, but also appears to fall as we lose a significant amount of soft tissue and fat that is characteristic of a youthful face. In addition, the bones in the face (our facial skeleton) get smaller, and the facial muscles thin. These factors combine to create the look we associate with the aging face. In addition, if we don’t replace facial volume, but just pull the skin and muscles tight, we end up with unusual lines on the face, plus a skeletal or cadaver look - and that is certainly inconsistent with an appearance of health or youthfulness! In general, those who have lost volume or have deepening furrows, creases, and lines characteristic ofaging can benefit from fillers. Those who are younger, but desire bigger lips or bigger cheeks or a more defined chin can also benefit from fillers. In the sections below, you will find information about a variety of fillers, including those no longer frequently used or on their way out. There are numerous facial injectable products available which can be used to restore the facial volume and fill out wrinkled or uneven areas of the face. For the safety of his patients, Dr. Bublik uses only FDA approved products on his patients, including Restylane, Perlane, Juvederm, and fat transfer. During your consultation, Dr. Bublik can recommend which facial filler or fillers can achieve the enhancement you desire. 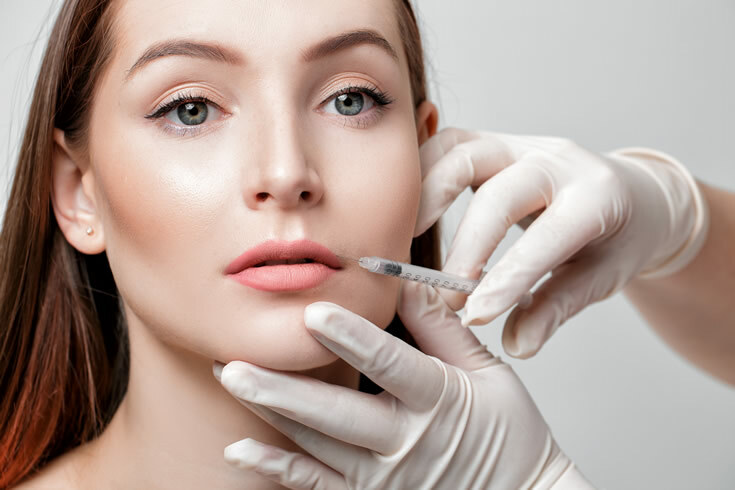 The exact injectable or filler used is individualized for each patient, based on the location of injection, the desired effect, and longevity. 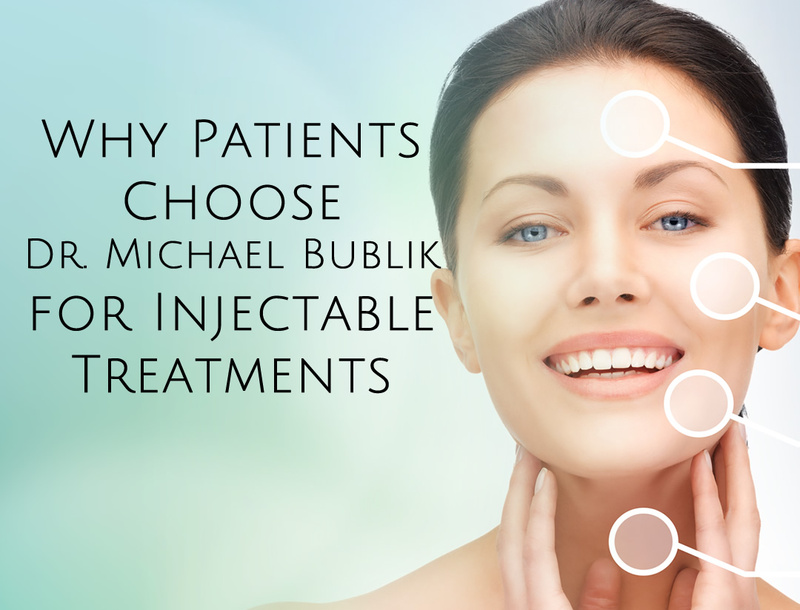 As well, for optimized results Dr. Bublik personally performs all injectable treatments himself. The result you'll see is a restoration of younger, smoother facial contours without an invasive surgical procedure. Facial filler treatments may be used alone or in conjunction with a resurfacing procedure, such as a chemical peel, or a surgical procedure, such as a facelift.